Those of you who like to travel in an RV or go camping usually find that staying connected to the Internet is a hassle. Sure, sometimes a smartphone or tablet computer can provide mobile broadband connectivity, but what about when there aren’t any cellphone towers nearby? 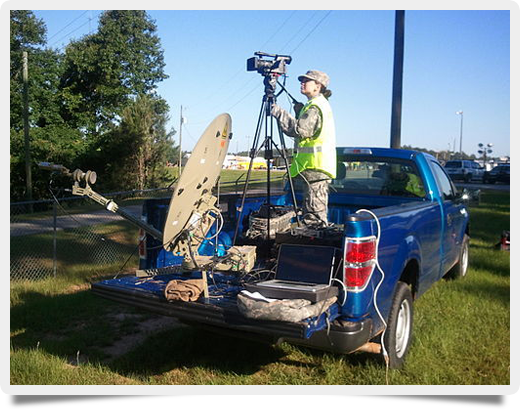 Mobil Satellite Technologies is a typical company providing mobile satellite services for a wide range of applications — from leisure time pursuits such as RV and boat travel to more serious scenes, such as a FEMA command post or a construction site. In addition to Internet services, they also offer VPNs, VoIP services, and video conferencing — all predominately using satellite communications. A wide range of service plans are available when using portable satellite Internet, and they are generally priced at a premium compared to other land-based or satellite Internet plans. Some are from companies famous for satellite Internet, such HughesNet, while others are with smaller firms, such as SkyEdge or iDirect. Some short-term plans lasting only a few days or weeks are suitable for emergency response scenarios, construction sites, or even a quick camping vacation. Some antennas used for portable satellite Internet tend to be smaller, especially when they are attached to a boat or RV. Others are similar in size to a typical DirecTV satellite antenna. Most use auto-acquire technology, which is a must for staying connected to a satellite while traveling. No matter the application — whether it be a vacation or a more serious event — portable satellite Internet helps to keep you connected to high-speed Internet when no other options are available. It is a perfect option for Internet access while traveling across the land in an RV or across the ocean in a boat.